What is the difference between dragon boating and rowing? Even though both are water sports, they come from different traditional backgrounds. Rowing has its history in the West, while dragon boating is based on traditions from East. Rowers sit in single file in boats referred to as ‘shells’ with their backs to the direction of travel and row with oars. 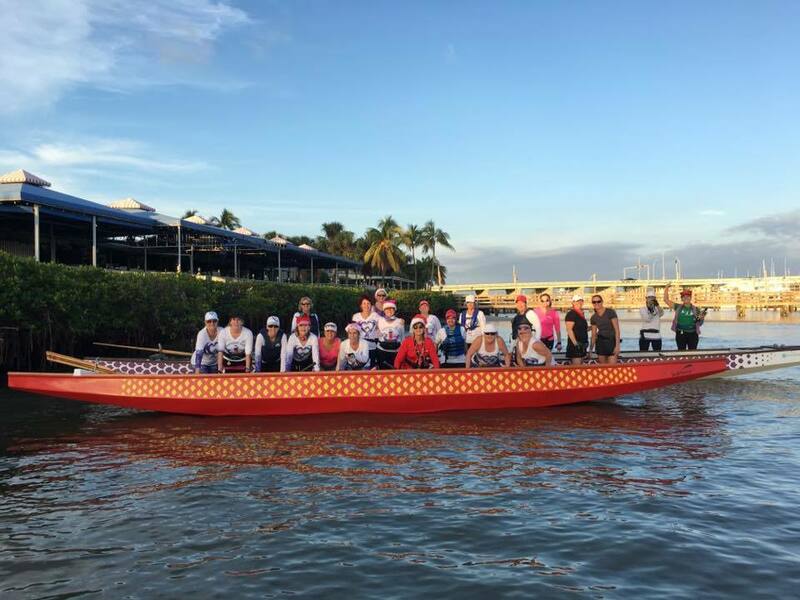 Dragon boaters sit in two rows of 10 and face forward using paddles to propel forward. How can I find out more about dragon boating and/or sign up for a practice? The best way to find out more is to come to a practice and see what it’s all about firsthand! Send an email to Captain Debbie Brooks at dragonboatdebbie@gmail.com for more information, or for questions about the sport, the team, and membership. What can I expect in a practice? Our on-water practices last from 1 to 1-1/2 hours and include technique drills and race pieces while incorporating elements of interval, endurance, and power training. 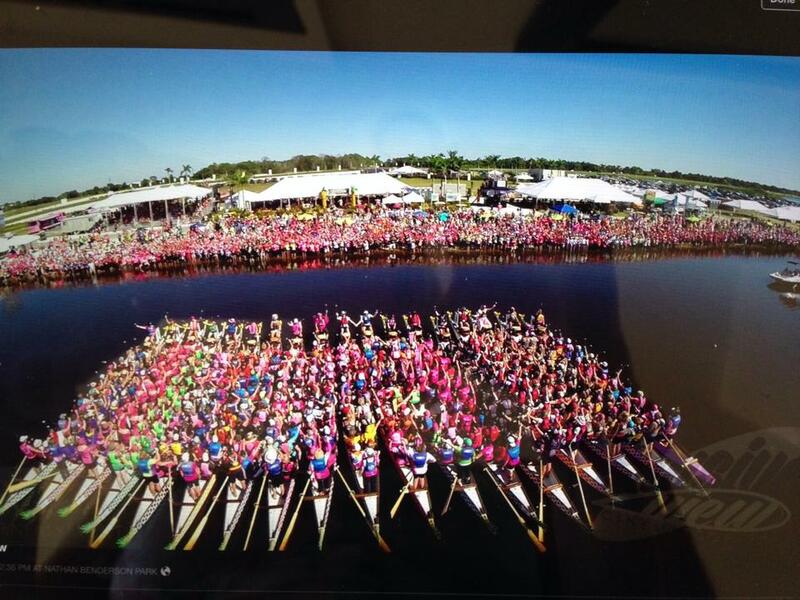 This is all done in a dragon boat. The great thing about dragon boating is that anyone (literally!) can join. 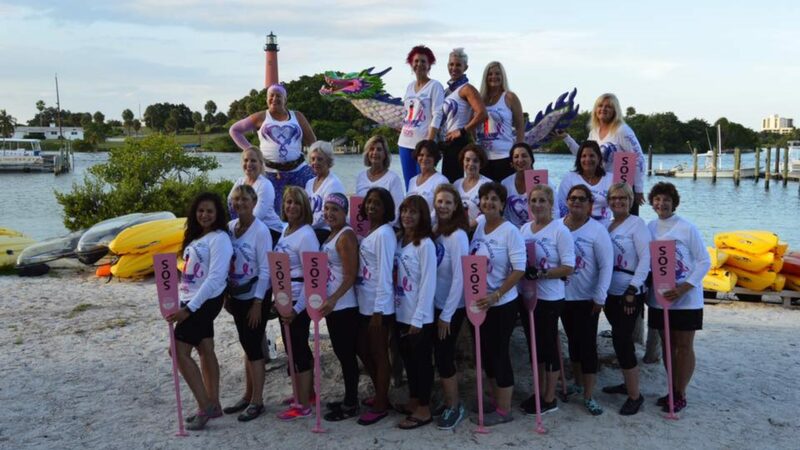 We welcome all Breast Cancer Survivors with a curiosity and interest in learning more about dragon boating, at all fitness levels and backgrounds. We also welcome our supporters, friends and family to join us on the water. Dragon boating is a water sport. Wear comfortable clothing, proper undergarments and shoes that you don’t mind getting a bit wet. The best materials are quick drying synthetics (DriFit or CoolMax). Water shoes, sneakers, sandals w/grip: If you wear sneakers make sure it’s ok for them to get wet and have sand on them. Sandals should have some treading or grip on the bottom to avoid slippage. Flip flops are not recommended. A pair of sunglasses will both help keep out the glare and protect your eyes from splashing water. A hat is highly recommended to keep you cool when exposed to the sun. Bring a water bottle (min of 32 oz) and sunscreen. You will definitely need water, even when it’s not hot. For comfort, a seat cushion for your behind is also helpful. While there are specially designed gel cushions which help avoid slippage, a garden variety foam pad works well for most people. 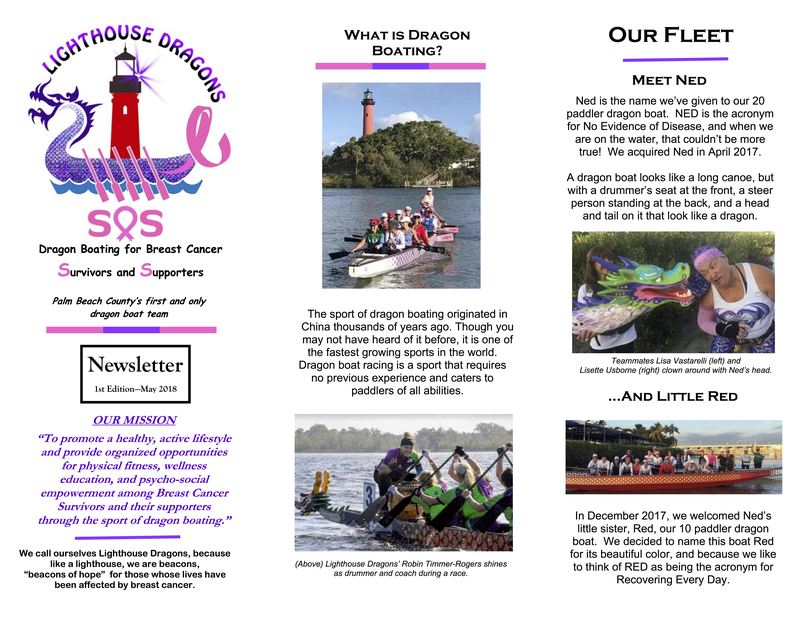 At the beginning, Lighthouse Dragons SOS will provide you with paddles, life vest (also know as PFD — Personal Floatation Device), safety training and dragon boat training. Where and when are the practices, do I need to attend all of them? Our practices are held at the Jupiter Outdoor Center, 1116 Love Street, Jupiter, FL usually on Saturday mornings and Wednesday evenings (for approved members) You can come to as many practices as you want. Obviously, the more you practice, the better you become! What other forms of training do you do besides paddling? We believe that in order to better your performance as a paddler, we need to build our cardio, strength, and endurance in addition to practices on the boat. That is why we also encourage members to engage in cross-training (running, swimming, biking, etc.) while off the boat. How often do you race, and where? We will race about several times per year. Do you have to race? No. If you do want to be considered for races, several factors are considered such as how many paddlers have signed up, race venue, practice attendance, etc. Most of our races are in Florida within driving distance. 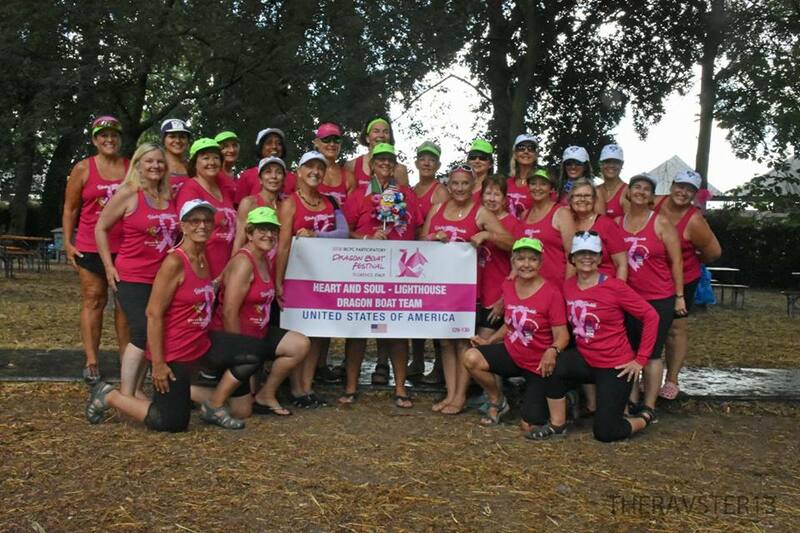 We are looking forward to participating in the 2018 International Breast Cancer Paddlers Commission Festival that will be held in Florence, Italy. What does your team do when they are not training and racing? Believe it or not, we are actually friends outside of training, too! We engage in a variety of social activities, celebrate team member birthdays, engage in local events and much more. We also participate in a variety of community outreach events as active citizens of the community and to promote the sport of paddling. 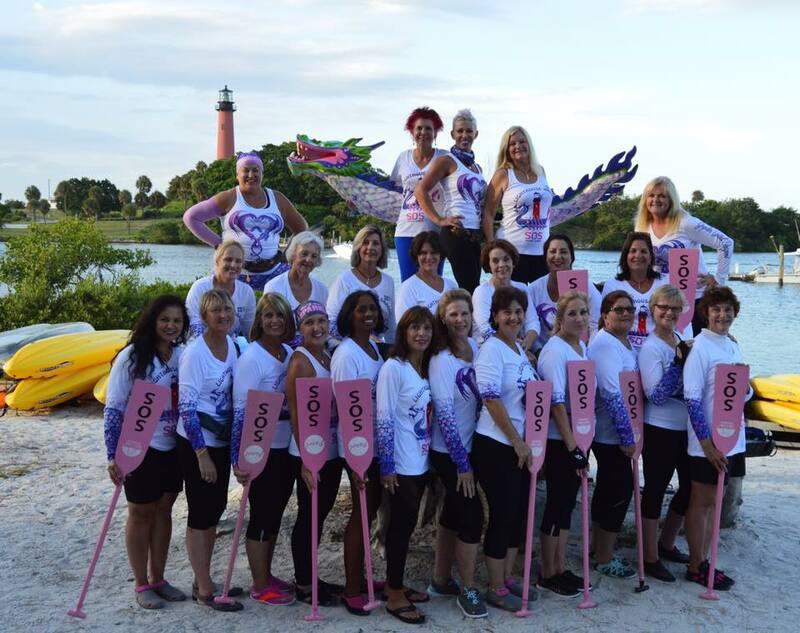 We are called Lighthouse Dragons, because like a Lighthouse, we are beacons, “beacons of hope” for all those whose lives have been touched by breast cancer.